Stem cells in Russia: panacea or illusion? During the Soviet War in Afghanistan scientists attempted the use of stem cells for curing psychological war traumas. Today the technology is available to ordinary people as well. Regenerative medicine is more popular among Russians than many other peoples around the world. 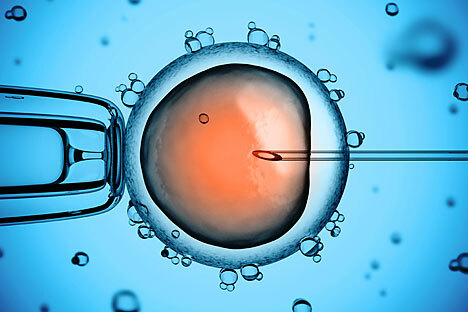 Today Russia has just six large banks for preserving stem cells. A seventh opened recently in Vladivostok, the capital of the Primorsky Region, at the Center for Cellular and Reproductive Technology. It is unlikely that this stem cell clinic will have troubles finding clients as local residents showed interest in the facility long before its official opening. Stem cells are a form of biological insurance in case of illness. They can be used to grow tissue for vital organs, such as the liver or the pancreas, or to cure people who have had strokes or are suffering from diabetes and oncological, cardiovascular and genetic diseases. Cells are obtained from a newborn baby's umbilical cord blood, and on some occasions from adults. These cells can be used by the donor themselves, as well as by their relatives. Since the cells are one's own, the probability of rejection is minimal. In March 2014 a cell transplant from umbilical cord blood was performed as part of Karina, a six-year-old girl, from Chelyabinsk’s treatment. In 2010 she was diagnosed with Fanconi anemia, a rare genetic disease that can lead to hematological disturbances, cancer and bone marrow failure. Karina's only chance of survival lay in the transfer of healthy stem cells to replace the defective ones in her body. In 2012 Karina's brother Nikita was born and it was his umbilical cord blood that was used in the transplant. Russia only recently became a part of the multibillion-dollar stem cell research market. There are about 300 institutes in the USA and more than 80 in Europe. The technology of applying stem cells in Russia was developed for the Defense Ministry. The research was initially confidential. During the Soviet War in Afghanistan scientists tried using stem cells for curing psychological war traumas. "The use of stem cells for psychological traumas is developing steadily in Russia," says neurologist Andrei Bryukhovetsky, who has dedicated over 25 years to research in this field. "First the technology was experimented with on calves, a project that included the participation of Valery Shumakov, the venerated transplant surgeon." In June 2014 the Defense Ministry announced its decision to continue the research. According to Alexander Vlasov, the Deputy Director of the Military Medical Department, a new scientific division will be formed within the Military Medical Academy. It will work on the creation of a stem cell bank for soldiers. Vlasov says that the division will be divided into three units: biological-pharmaceutical, medical-prophylactic and engineering-technical. The first will actively develop a stem cell bank for military personnel who participate in risky assignments and in dangerous areas. Banks for preserving stem cells started appearing in Russia in the 2000s, however, not all of them still exist. In 2014 the Flora-med stem cell bank in Moscow disappeared; it had existed since 2003. Clients had paid regularly for the preservation of their newborn babies' stem cells, but they vanished along with the bank. Some stem cell banks went bankrupt. The reason may be that, despite the growing interest in regenerative medicine, Russians are still not ready to pay the high price for preserving stem cells. Yet, the costs at the Moscow stem cell banks are relatively low in comparison with other international clinics. For example, the procurement of an umbilical cord at one of the Moscow centers costs approximately 95,000 rubles (roughly $2,620). In the US the same service costs approximately $12,000. But success stories can also be found among Russian stem cell banks. In 2013 the Human Stem Cells Institute (HSCI) opened the Genetico Center in Moscow, which cures patients suffering from genetic diseases. Among the diseases it treats are Congenital Immunodeficiency, Krabbe disease, Omenn Syndrome, Diamond-Blackfan Syndrome, Fanconi Anemia and many others. The first child to save an older sibling from Shwachman-Diamond Syndrome was born in Russia in 2014. The center will soon start working with families from Europe and Asia. HSCI has also developed a drug called Neovasculgen, which is currently being registered in the USA. The drug is designed to cure patients suffering from Critical Limb Ischemia, which has become a global pandemic in recent years with over 200 million people currently afflicted by the disease. It is the biggest cause of amputations in Russia with about 500 for every 1 million people per year. Read more: Which 3D organ will be bioprinted in Moscow first?